Azerenergy OJSC, in accordance with the "Program for the rehabilitation of the power system of Azerbaijan", continues work to restore the "lost" generating capacity in the power system, Trend reports referring to the company. Despite the fact that the capacity of the Janub thermal power station with an installation capacity of 780 megawatts was 520 megawatts during commissioning, and as a result of the work done, the capacity of the power plant was increased to 720 megawatts, and thus the "lost" capacity of 200 megawatts was restored. 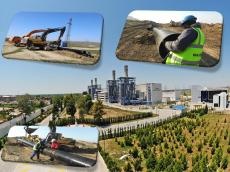 A new gas line with a length of 25 kilometers from the gas distribution station, located in the Hajigabul district, to the Janub power station in Shirvan is being laid in accordance with the program. Currently, two gas compressors operate at the Janub power station, which increase the gas pressure from six to 25 atmospheres. Thus, on average, seven million kilowatt-hours of electricity are consumed in a month. However, after the new gas line is laid, the gas will flow directly into the turbines, respectively, there will be no need for compressors and the power consumption will be reduced. Thus, another important step will be taken to restore the "lost" power.